Just a quick post. I've been sorting through some of my files on my computer and decided to put together the rest of the photos that I took during the partial solar eclipse back in March into a slide show. It shows the progress of the eclipse from first contact. I got home after Astrocamp riding on a wave of enjoyment and astro related optimism. I had a great time meeting lots of people have a huge amount to be thankful for. I look forward to meeting them all again, and this time, with fully fit and operational leg! Coming back home and monitoring my Twitter feedback and Astrocamp Facebook page, the timelines have been full of similar thoughts and expressions of thanks to all concerned. 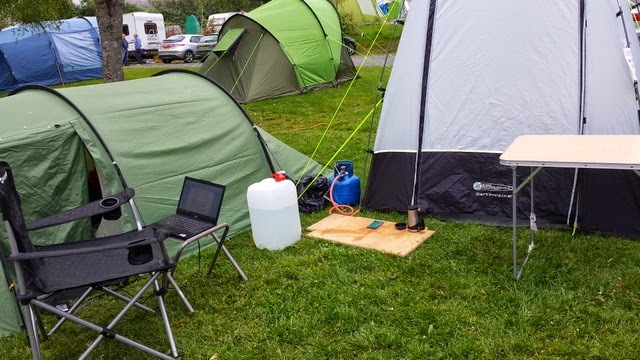 I’ve already put in for the time off in September for the next Astrocamp, and wait to see if I can get it signed off, and then to see if I can get a pitch. September does provide a wider window of observing opportunities with its darker nights, and perhaps (hopefully) more reliable weather. We shall see. The night that most people would have arrived home was last night, the 12th May. 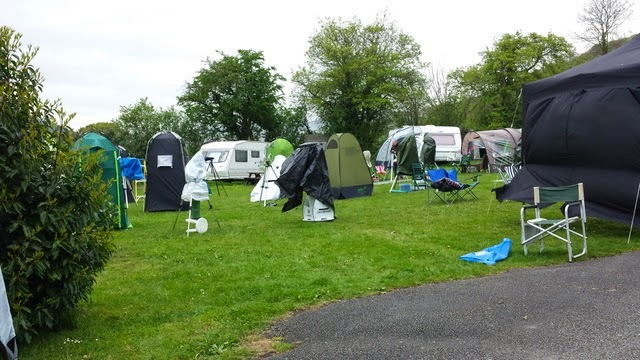 Given that over the whole of Astrocamp, the total amount of night time observable conditions stretched to barely 45 minutes, you could say that it was typical that the first night at home was forecast to be perfectly clear. The moon was due to rise in the early hours of the morning, and so the conditions were favourable. That is, except for the fact that the following day, everyone was back in work. However, that didn’t stop me from getting the SBT out in the back garden and carrying on the start party in my own little way. I would like to think that there were others doing the same thing in their own observing sites up and down the country. And so, my observing report. The nights are quite light this time of year, so the first objects tend to be the brightest ones visible in the sky. The session started at around 21.50 when the horizon was still quite bright, but Jupiter and Venus shone brighter. My target was Jupiter and its moons. I first observed it using the 8mm BST, and within the same field of view managed to pick out an unclassified 10th magnitude star. A tiny pin prick of light. The planet itself showed up really well showing both the equatorial belts, and much more detail than I have seen recently. Dropping in the 5mm BST eyepiece, the image was slightly blurred, but the features were still visible. The dual-speed focuser upgrade certainly helped achieving optimum focus on the planet. By 10.30, enough of the constellation of Leo was visible against the darkening sky for me to navigate to the Leo Triplet. Whilst not the darkest of conditions, I could still make out all 3 components of the triplet with relative ease. However, I didn’t observe it for long because of the lighter conditions still present. Looking across the sky, I started picking out some of the other constellations. The bowl of Virgo, Coma Berenices and Bootes. High overhead, I could see Ursa Major. Whilst looking around Ursa Major, I thought I would try to locate M101, but initially I ended up viewing the Whirpool Galaxy, M51, by mistake. Both cores were clearly visible, and now the sky was starting to get much darker, more detail surrounding the cores started to present itself. Whilst I was pleased to see it, I still wanted to track down M101, so I moved on. I was using the 32mm Panaview eyepiece for this target, and it didn’t fail to impress. The target wasn’t particularly bright, but it did appear very large indeed. Perhaps because of the low magnification, or the timing of the observation, I couldn’t make out much in the way of structure, but nevertheless, it was an object I was really impressed with. The session continued. Onto M3, a condensed cluster in Canes Venatici. I spent quite a while observing this target. I have seen it before, but only in the 150p. This time, with the SBT, I decided to spend a bit more time swapping around the eyepieces. I first picked it up in the 32mm eyepiece. At first, the cluster was obvious, but it wasn’t particularly easy to resolve any particular stars in the cluster. I decide to try the 12mm BST instead. The feint fuzzy area of the cluster suddenly became much more defined. I started to be able to pick out many more individual stars. Possibly even hundreds. I decided to push further, and so, I dropped in the 8mm eyepiece to see exactly how good I could get the view. This time, I could see even more. With the smaller eyepieces, the background to the cluster grew ever darker which helped me to resolve even more detail. It was the main ‘wow’ moment of the evening for me. Leaving the 8mm eyepiece in the focuser, I tracked down the next target, M92. This was another awesome cluster, especially at the higher magnifications. I thought it very similar to M3 and was equally as impressed. Moving further into Hercules, I decided that time was getting on. I had put myself a cut-off time of 11.00 as I needed to be up for work the next morning and I had already exceeded it. But, after the disappointing weather of the weekend, and conditions so favourable, I decided to squeeze one more in before the end of the night. The final target was M13. An extract from the notebook on the night…. That kind of says it all really. These are the first set of true clusters I have gone after since the arrival of the SBT, and they haven’t disappointed. At 8mm, M13 was readily resolved as a vast collection of individual stars. I was impressed. Very impressed. Sadly, I had to call it a night there. Conditions were so good and it was a bit of a wrench to bring myself to put the scope away. Conditions are favourable for tonight too, but it remains to be seen if I can get outside. If only this were a Friday evening…. So, that’s the report of my Astrocamp hangover. The event has certainly fanned the flames of enthusiasm of the hobby and I managed to head off the ‘downer’ of having to come home by having a cracking little session out the back garden. And remember, if we are on course to have a collision with an Asteroid, all we need to save the entire human race is a huge quantity of Dulux. I saw Sunday as the main day for Astrocamp. On the agenda for the daylight hours were a number of different activities and things going on. 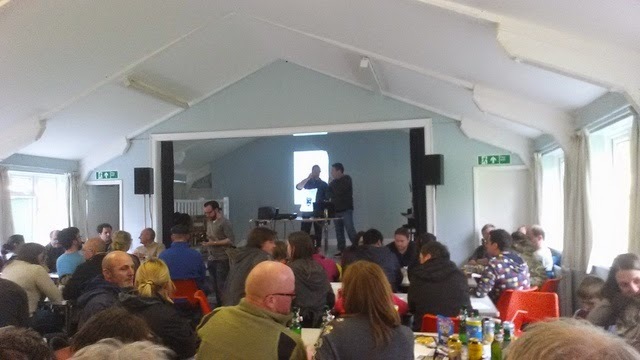 In recent times, most of these things have happened in the local pub, but as the popularity of Astrocamp has increased over the years, the decision was made to make use of the village hall in Cwmdu. It would accommodate up to the hundred or so people that were anticipated to attend the daytime events. People were encouraged to be there for 2 o'clock, and as if enthusiasm wasn't enough, there was also a licensed bar there too, complete with a barrel from the local brewery. Damn those anti-inflammatory drugs! The day was set to be mostly cloudy with almost no chance of observing in the evening, so I thought it was important to make the most of the offerings during the day. To kick off, the much anticipated pub quiz. But, this pub quiz had prizes worth winning. The quiz was all astronomy related as you might expect with a prize of some rather smart Vixen binoculars for the team that come last. The team that one got a travel telescope, complete with GoTo Alt Az Sky-Watcher mount. This, perhaps unsurprisingly was won by Dr. Chris North and his team. Finally, a really nice touch, a team was then selected at random to win the final prize which was a full set of Baader Hyperion eyepieces in a case. 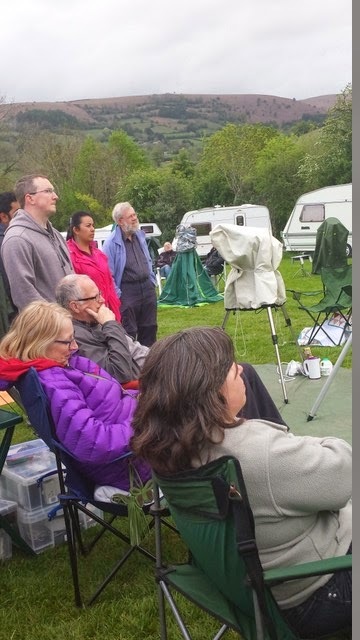 Some fantastic prizes, all supplied by Neil and Jane at Tring Astronomy. Everyone at the ready for the start of the Astrocamp quiz. Next on the agenda was a talk by the famous (in UK astronomy circles anyway) Nick Howes. His talk was fascinating and was based on the life and death of our planet. He started talking about the astronomical dangers found out in the cosmos, and which the most scary of them. He spoke about Black Holes, Gamma Ray Bursts, Super Novas and the like. But, in the end, settled with the threats that we face on the planet from Asteroids and Comets. As the talk progressed, he spoke about the finance and funding that is in place to research and scan for these threats currently out there. The money that it cost to produced 2 films, Deep Impact and Armageddon would fund these projects for years, and yet, it was decided to put the money into films. Some facts that came out at this point were how the human race could cope with some sort of large impact. We, as astronomers and amateur astronomers especially, can aid in the detection and discovery of Asteroids. When an asteroid is discovered, it is thought that we could have as much as 30 years to plan for and action some sort of defence against an impact if it was found that it was on a collision course with Earth. There are many different theories on how, but that's the importance of research and development. We could of course send Bruce Willis with his team, but Nick spoke of the very weak gravitational pull from an asteroid. Most recently demonstrated with the landing of the Phillae Lander on the Rosetta mission. The fact is, the lander bounced. A long way up. And the scientists still don't know exactly where it is. Another theory is to deflect the asteroid, to somehow change it's orbital path, including a crazy idea know as the Paintball effect. One for another day... But his point was, that we stood a chance with 30 years notice. However, comets are different. Comets are often discovered much closer to Earth. Often untraced. especially if come from the direction of the Sun. The sun is so bright, it washes out many objects in that direction. If a comet is discovered and found to be on a collision course with Earth, it is thought that we could have as little as 12 months, perhaps 18 months tops. There is no current defence in place against that. The time it would take to organised and put into place an idea, which may have a very slim chance of working anyway, far exceeds the 12 to 18 months we would have. We would need decades. During the talk, there was a fairly political element to different aspects of it, but some points were made to help illustrate the problem. For example, the UK government is currently pushing through and building a new train track that will help get people from London to Birmingham a little bit quicker - if it works, and if there are no delays caused by leaves on the line, or the wrong snow. Nick also spoke of the renewal of Trident, a nuclear deterrent that if is ever used would result in a rather unhealthy population decrease anyway. The billions that are earmarked to be spent could be put towards the necessary research and development. Nick also spoke about estimates of 800 billion to 1 trillion undiscovered potential threats in the Oort cloud in the outer reaches of our solar system. He spoke about the Jupiter impact in 1994 where a comet broke apart as it entered the gravitational field of Jupiter, and the resulting multi-impacts on Jupiters surface that were observed by astronomers both amateurs and professionals alike. If one of those fragments had hit Earth, it would have been annihilation. Finally, Nick began to round off his talk about how we as amateur astronomers can help detect asteroids and comets. Some fairly basic imaging kit can be used and he urged people to not just take dozens or hundreds of tracked frames, stack them, process them and get the resulting pretty picture, but to also look at the data, and compare these individual frames to each other and look for anomalies. He gave examples of software that is cheaply available to help give more data in terms of predicted orbit and tracking. It really did illustrate how easy it can be. After a short break, it was time for the Masters of the Universe quiz, and we were playing for beer! Damn those anti-inflammatory drugs! This quiz was very much harder than the previous. It comprised of 12 questions and required some very specialised knowledge. I couldn't contribute to this one at all. Way above my head! But, the team got a respectable 5 out of 12. When we first went into the village hall for the event, there were small pieces of paper left on the tables. As mentioned earlier, this event used to be held in the local pub but has had to be relocated. As a whole, it was entitle Astronomers in the Pub. But, the organisers of Astrocamp wanted a new name for their own pub. One that could be used for all future events, and they were asking for suggestions for names. I chipped in with The Core and Cluster, and The Spiral Arms. Guess what? I only went and won it! The prize, a free round of drinks from the bar for me and the team! Damn those anti-inflammatory drugs! So, I got the round in for everyone, and I walked away with a can of coke, and the promise of a free beer next time I come to Astrocamp! To round the day off, people left the village hall and headed back for some dinner. The next talk I wanted to attend was for a GoTo workshop. I don't own a GoTo scope and at the moment, do intend on getting one in the future. However, I thought it would be good to see the systems in use. 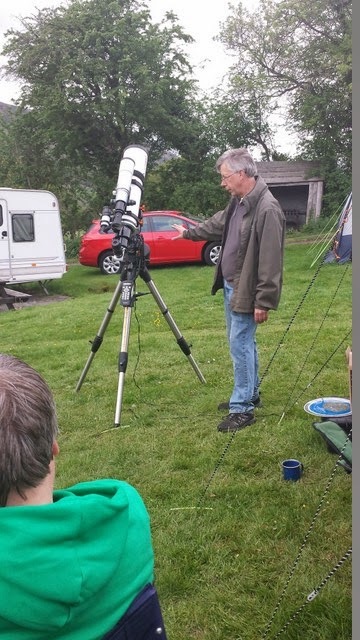 The talk was held on the common with information given on how to polar align using a polar scope, the important of setting position, date and time and also how to carry out alignment when using 1, 2 or 3 stars. The GoTo tutorial audience listening intently. Finally, on how to carry out alignment when Polaris isn't visible. It was a great little session which I enjoyed. And so, that brings me to the end of day 2. Over the last couple of weeks, observing and activity of almost any kind has taken a back seat. One ankle injury and two knee injuries along with a visit to the doc has meant that rest has been the order of the day. So, my visit to astrocamp has been under threat for a while. In truth, I'm still having to be careful what I get up to, but I've made it in some degree of discomfort. I've got my 5 meter by 5 meter square of grass and my electric hookup on which I have my two tents. One for me and one for the SBT! My square bit of turf with enough to keep my occupied. 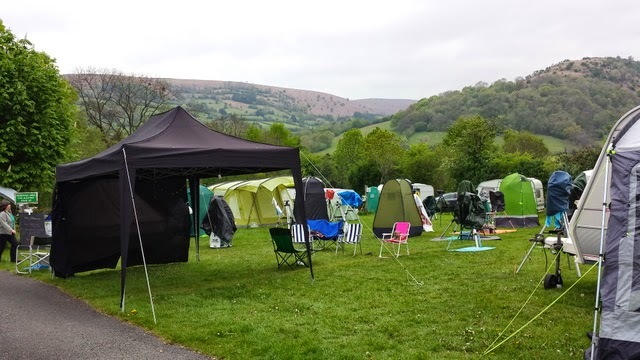 The SBT tent on the right. First impressions, well, it's a busy event and certainly full of like minded people. But they do like to cram people in. Perhaps a little too busy. Should I have gone for a larger pitch? Perhaps, yes but I didn't want to take a larger pitch that could accomodate several people in a larger tent. And kit! Well, there's a huge amount on display and in use. Everything from table top scopes for children to whole imaging sets and 18" dobs. Social observing at it's best - except most people are still in bed nursing hangovers! I've met up with Neil and Jane from Tring Astronomy centre again, and already re-acquainted with Rae who I met once a few years ago at SGL. Along with some Facebook friends from the Cotswold Astronomical Society. So, to the observing. Weather conditions haven't been ideal. The sky did begin to clear a bit last night, but only slightly. It was enough for the brighter planets to shine through and observations were made of Jupiter with 3 of it's moons. I haven't checked, but I assume the fourth Galilean moon must have been behind the planet at the time. I have my list of prepared targets to go for while at camp, but the weather conditions meant that more time was spent more cloud hopping to pick out targets between the clouds, than star hopping to get to targets in constellations. Nevertheless, I did manage to pick up the Leo Triplet last night. All 3 of them fitting in the 70 degree field of view of the 32mm Sky-Watcher Panaview. My only other target for the night was the Whirlpool galaxy. Both of these target I have observed before, but given the conditions, I think I was lucky to get them.